Vitalstatistix spoke with artists Nicola Gunn and Steve Mayhew about their thoughts on theatre making and collaboration, other obsessions, and their current projects with Vitalstatistix. 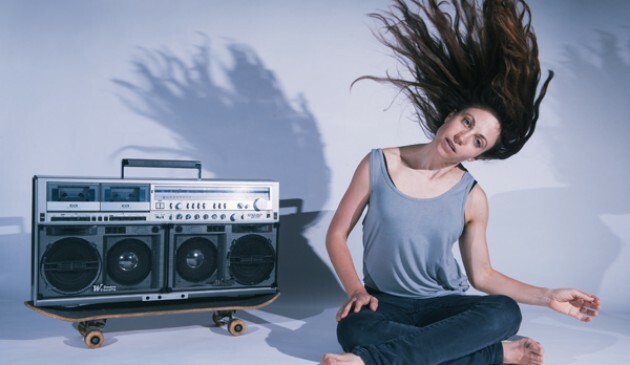 Nicola Gunn makes contemporary performance that combines text, choreography and visual art in a self-generated impulse to tell a story or explore a form. In June she and collaborator Tamara Saulwick will undertake an Incubator residency with Vitalstatistix developing an ambitious new performance called Super Imposition. They will present showings on 30 June and 1 July. Steve Mayhew is a director, dramaturge, curator and creative producer with many interests including regionality, dance dramaturgy and digital theatre. In 2017 he is working with Vitalstatistix to produce a series of projects co-presented with Performance & Art Development Agency, an organisation co-founded by himself and Vitalstatistix Director Emma Webb in 2015. This year Steve is also co-curator of the 2017 Australian Theatre Forum, alongside Alexis West. Vitalstatistix: Tell us about something you are currently obsessed with? Nicola Gunn: I am thinking a lot about shame and humiliation lately because of another work I’m making. But I generally have the same three recurring thoughts that I suppose you could say I’m obsessed by – and those thoughts are about work, getting old and dying alone. How we might talk openly with honesty to constructively shift Australian Theatre into new and exciting places? Vitals: You have each travelled quite a lot in recent years; what kind of perspective does this offer you about the arts in Australia (if any)? SM: I was in Paris, a place where art and culture just oozes out of everything, on November 8th 2016 the day Trump was elected and I began that day in a bit of a daze, not wanting to get out of bed and transfixed to the Deutsche Welle TV station’s German influenced indignant and shocked commentary. I eventually dragged myself outside and found myself surfacing from a Metro station and I suddenly felt this compulsion to visit the little Statue of Liberty that I had a sense was nearby. You see 40 years had passed since I had last visited Paris as a child of 7 years and so I was having this almost déjà vu recollection of knowing exactly where I was. I quickly located it on Google maps and I wasn’t far away at from where it stands at the end of the Île aux Cygnes, so my 40 year retained memory was pretty good! I then walked to Palais de Tokyo to see an immersive and participatory work by Tino Sehgal that (PADA commissioned) artist Chris Scherer was working on and performing in. A part of the work involved me talking to a child aged about eight years in which she asked the very simple question “What is progress?” that led me to reflect expansively on what had happened in the world that day, she passed me onto a young man who carried on the conversation and after a while he passed me onto a woman about my age who passed me on to an elderly woman who was in her 70s. All the while we carried the conversation as we walked and talked in this huge picture-less gallery space. Finally the woman left me standing alone once she conveyed her happiness at being able to live by the beach and not worry as much about things, suggesting that maybe I should to. Walking back to my apartment after that experience I recalled Nicola’s moral conundrums and complexities about the duck in Piece for Person and Ghetto Blaster. I suppose this story is a long way round of saying that the type of art experiences I love, and the life I aspire to lead, is one where one is informed by the other’s permeation. I suppose when you travel you can be more susceptible to having that type of experience just occur, whereas at home in Australia I often feel I have to separate it, section it off and MAKE TIME for it. Vitals: Nicola, tell us about Super Imposition. What is the work exploring and where are you at in its development going into the Incubator residency with Vitals? How are you approaching your residency and the opportunity to show the work-in-development in front of an audience at the end of the fortnight? NG: We’re coming at the project from slightly different perspectives around the idea of ‘controlling the narrative’ – who gets to control the narrative and who gets to decide what’s in the public’s interest, as opposed to what’s of interest to the public. Primarily we’re interested in the confrontation of our practices with that theme in mind – and what kind of work it might generate. We watched this amazing interview of Helen Mirren by Michael Parkinson from the 1970s and Helen Mirren said, “You are who they say you are and you are who they think you are.” Or something like that. Helen Mirren said something like that in an interview with Michael Parkinson in the 1970s when he asked her what she thought of all the media headlines alluding to the fact her sensuality and her ‘figure’ overshadowed her acting ability. Vitals: Nicola, this is your first collaboration with Tamara Saulwick. In the past you have made series of works through collaborations that explore form as well as ideas (such as your recent works with dance artist Jo Lloyd, Piece for Person and Ghetto Blaster and Mermermer). Can you talk to us about how you approach these types of collaborations – is it like a duet or a duel or a bit of both? NG: Oh um probably a bit of both. Collaboration is hard and I don’t agree with this idea that a collaboration is about finding accord or consensus; I think it’s often the conflict of materials that is most interesting. Vitals: Both of you tend to play multiple roles in any given project that you are working on. Nicola, you explicitly state that you take responsibility for each of your productions from concept to realisation. Steve, you often blur lines between artist and producer. NG: I’m not really sure how to answer this. I make performance as a writer, director, designer and performer and it’s always been like this for me because that’s the way I choose to work. I don’t want to be defined by one role. Of course, I would love an administrator to take on the day-to-day running of my company (of one) because I am inundated by grant writing, budgets, tour producing, pitching and it’s beginning to be a bit overwhelming and I fear my artistic work is suffering as a consequence. Unfortunately our funding system hasn’t quite caught up with contemporary practices; I won’t be recognised as a company or eligible for organisational or structural funding until I become incorporated and get a board. And this, I’m sure, comes with its own set of problems. SM: In the year I graduated from university (OMG 26 years ago!!!) I realised that I could be much more than just a theatre director and that it was actually only a very small part of how I could participate in art making. I’ve purposely made decisions in my career so I could gain experience in the so called ‘non-artist’ side of the arts – you know managing arts companies, programming festivals, producing art works and art projects and programs. I’ve done it to understand the environment we operate in and the leadership that is required to navigate it. I suppose you could say I’ve approached those roles with a certain ‘artistry’ combined with ‘strategy’ – call it ‘creativity’ if you will. I’ve done creative residencies and collaborate with other artists so as to satiate my ‘creative’ and ‘artistry’ chops. I’ve approached making the recent soundtrack for the work in progress Cher in a similar way to how I have helped produce it and assisted in giving its dramaturgical shape. Whenever I do anything with anyone I ask the same questions of us all: WHAT is it? WHO is it for? WHY is it a thing? WHERE is it? WHEN is it? and HOW should we do it? Oh … and … none of these questions have to be answered in full immediately or from the start, it’s often in the making that you find these answers. Perhaps it has always been this way for many artists or perhaps it reflects something about current economies and modes of art making – what do you think? Vitals: What are your thoughts about theatre in Australia at the moment? How do you feel about the function of theatre, or art, or how it might critically engage with the world? How is theatre being reimagined? What are some trends and interests and dilemmas for theatre makers that you are experiencing or hearing about? NG: Recently I was invited to a meeting to discuss ‘the lack of opportunities in theatre available to women, people of colour and gender diverse theatre makers.’ Unfortunately I was unable to make it, but would be interested to know what the outcomes were. The kind of things I have been thinking about recently are the lack of opportunities for career progression as an independent artist in Australia. The idea of continually applying for project funding every year is an extremely depressing and demoralising proposition. So what does career progression look like for an independent artist? SM: All I can say is that everyone must pay attention to the First Nations companies that have recently received four year funding through the Australia Council across the Theatre, Dance and ATSIA Sections. Yirra Yaakin, Ilbijerri, Marrugeku, BlakDance, Cairns Indigenous Art Fair, Moogahlin and many more. These companies are overflowing with excellent ideas and stories to share, often in art forms that converge, blur and combine. Vitals: Steve, this year you are co-curating the biennial Australian Theatre Forum, which will be held in Adelaide in October. Can you tell us a little about ATF in general and how you and co-curator Alexis West are approaching this year’s Forum? SM: I’m really excited about co-curating ATF with Alexis – we’ve had some great laugh and tear filled discussions working on it. Three days is just not enough to really give justice to all the amazing thinkers and makers out there to have their voices heard (especially from our First Nation’s artists listed above). An incredible amount has changed since the last one at the beginning of 2015 – funding and organisational landscapes changed overnight in May 2015 and then again in May 2016. So we’re thinking we will begin there: looking at the last two years, examining and celebrating our actions and the foundation it is providing for us as we move forward. ATF will be held alongside OzAsia and this also gives us the opportunity to invite an Asian point of view for comparison and influence as a part of our very ‘Australian’ discussions and issues. There are some important discussions we believe we need to nurture through the forum, such as the evolution of an AMPAG framework and the retrieval of the women in theatre discussion, to name only two. The EOI process for independent artists is now open and we really encourage them to apply NOW. We want to structure the forum so that a number of independents are leading the discussions. We are also inviting all the festivals, small-to-medium and major theatre organisations to bring and support an associate artist or producer to attend, encouraging the future leadership of our sector to be a part of the conversations now. Vitals: What do you value about Vitalstatistix in the current arts landscape? What role can small organisations play in supporting independent artists and art form development in these lean, interesting times? NG: Vitalstatistix has played an intrinsic role in supporting four of my projects now, through either residencies or presentations. One of those works will be touring to Europe, Canada and Chile over the next 12 months. The support artists receive from organisations like Vitalstatistix is not just project-based but it’s a long-term investment in an artist’s practice. I personally value the space and time Vitals offers: for me, creating in a residency model away from my home city is the most productive way to make work. SM: Vitals is SO important to Adelaide and South Australia in these times. It’s one of the very few organisations in this state that is constantly engaging with individual and independent artists practice, giving them a solid and safe platform to take risks and innovate. People have to realise that this platform is very VERY different to a theatre company that is run by an Artistic Director who is fundamentally leading a development or rehearsal processes with a group of independent or freelance actors, designers to their vision. Vitals’ current platform provides a multiplicity of voices, actions, experiences and strategies that are creative and artist led. It effectively acts as circuit breakers for these times where a certain kind of self (and often government led) aggrandisement in our arts and cultural landscape creates an ever infuriating and ridiculous caudal lure. Vitals: What are you each reading or listening to at the moment? NG: I just finished reading Men Explain Things To Me by Rebecca Solnit and before that, I read The Faraway Nearby by the same author. At the same time I was reading Jon Ronson’s So You’ve Been Publicly Shamed. I’ve been listening to this Canadian podcast called Someone Knows Something about unsolved crimes. I have a weakness for true crime. I’m terrible with music. I still listen to the radio. This piece about why some countries drive on the left side and others on the right is actually quite an interesting overview of empires, wars, swords and camel trains…thanks to Sascha Budimski who posted this on his Facebook page recently.